← Built-in high pressure misting system with no visible tubing in Fort Lauderdale, Florida. 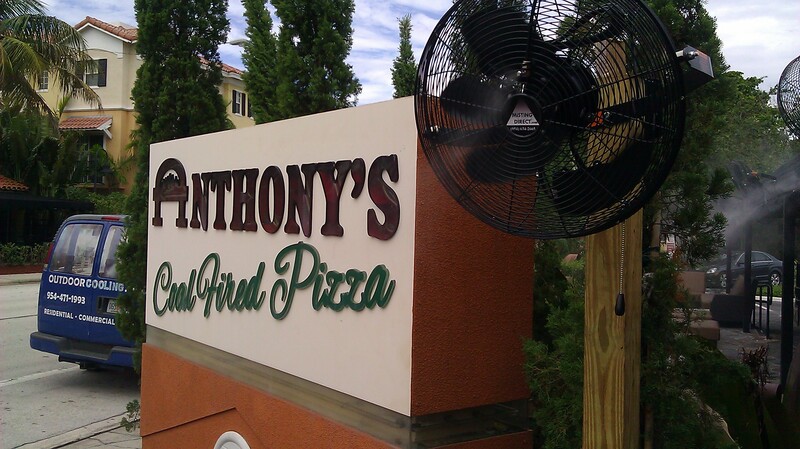 One Misting Fan is show with the Anthony’s Coal Fired Pizza Sign In Delray Beach ,Florida. We installed this high pressure misting system with fans attached to free standing posts and the awning. Misting nozzles were also installed along the outside edge of the awning. The Misting Direct brand misting pump was installed remotely so it is out of sight. Misting Direct brand high pressure misting systems are the best choice for commercial applications. Misting system installed in humid areas like south Florida must be designed properly on order to cool the air without getting anything wet. Anthony’s Coal Fired Pizza has been our customer for years and we are pleased to meet all of their outdoor cooling needs. If you have not been to Anthony’s yet, their pizza is amazing! They are located at 115 NE 6th Ave Delray Beach, FL 33483. For a free quote for your restaurant, home or other application contact us today! Another view of this high pressure misting system installed by Outdoor Cooling Systems. The misting system keeps the outdoor dining and lounging areas comfortable, even on the hottest days of the year. Both misting fans and mist line with misting nozzles were used in this system. The black awning gets especially hot so the misting system is essential to keep the outdoor dining are cool. Outdoor Cooling Systems designed and installed this high pressure misting system at Anthony’s Coal Fired Pizza in Delray Beach Florida. The misting system keeps customers cool year round at this south Florida restaurant. This entry was posted in Uncategorized and tagged awning cooling, high pressure mist, high pressure misting, mist awning, mist system, misting direct, misting system, outdoor cooling, outdoorcooling systems, restaurant cooling. outdoor cooling, restaurant mist. Bookmark the permalink.